At One Time, You Could Work Your Way Through College – But Not Any More. At one time, not that long ago, a student could work at a minimum wage job over the summers and during holidays, and be able to cover the total cost (including room and board) of attending a four-year state university. That is now far from possible. With students now returning to school, it is perhaps a good time to look at what has happened to the affordability of college in recent decades for middle class families. The chart above provides one indicator. It compares what a student could earn in a summer job at the minimum wage, or in year-round work at the minimum wage while attending school (i.e. during summers, holidays, and part time during the academic term), as a ratio to what it would cost to attend a four-year state university. The state university costs are for in-state tuition and required fees, plus the cost of on-campus room and board. The figures are from the National Center for Education Statistics of the US Department of Education (with figures for 2013 calculated based on the 2012 to 2013 growth in the College Board estimates). The university cost figures are for four-year, degree granting, state colleges and universities (i.e. they do not include two-year community colleges), and cover all such state schools. The cost of attending the elite state schools (such as Berkeley, UVA, or the University of Michigan) would be more. The years shown on the chart are for the beginning of the respective academic years (i.e. 2013 is for the 2013/14 academic year), and the minimum wage rate used is that which was in effect in July of that year. The chart indicates that one could have covered the cost of attending a state university in the 1960s and 70s solely through minimum wage work. Based on just a 17 week summer break, one would have earned enough to cover an average of 82% of the full cost of attending school. An industrious student working full time over the summer and during vacation breaks (such as Christmas), plus 10 hours per week during the academic term, would have been able to cover the full cost and more – an average of 143% of the cost of school. Hence summer work plus a bit more during vacations would have sufficed to cover the full cost of college. In terms of dollar figures, the full cost of attending a state university in 1963/64 would have been $929, in the then current dollars. A student could have earned $782 just from working at minimum wage over the summer, or $1,357 by working at minimum wage over the summer, during vacations, and 10 hours per week during the academic term. These are, of course, just simple indicators. One might have been able to earn more than the minimum wage, and/or worked a different number of hours. 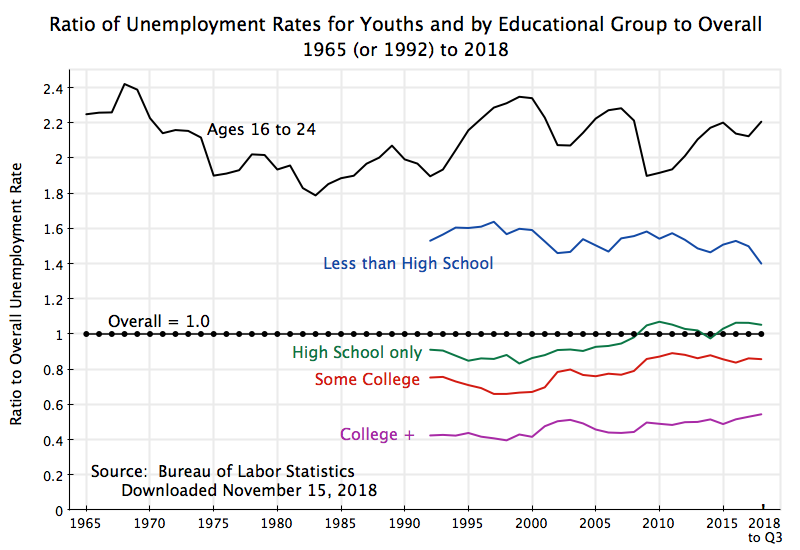 But the point is that in the 1960s and 70s, when baby boomers such as myself were going to college, it was possible for the student alone, simply by working at the minimum wage, to have paid for the full cost of attending a four-year state university. That began to change in the 1980s, as Reagan took office. The change is indeed striking. Affordability then began to fall, and it has fallen steadily since, as seen in the chart above. By 1986, a student working even full time over the summer and during vacation breaks, and 10 hours a week during the academic term, no longer would have been able to cover the full cost of attending school. 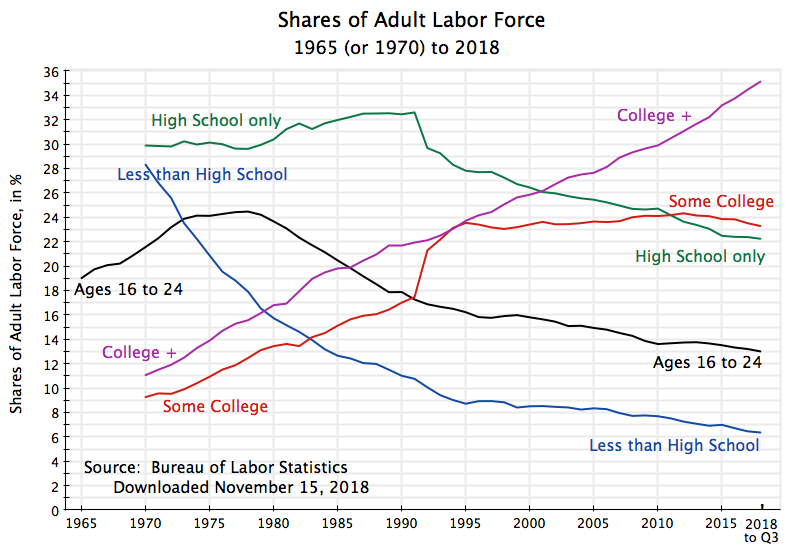 The share of schooling costs that could be covered by work then continued to decline (with some bumps up when the minimum wage was sporadically changed) until the present day. By 2013, summer work would only cover a quarter of the cost of schooling, while more comprehensive work over the entire year would only cover less than half. In dollar terms, the average cost of attending a state university (for tuition, room, and board) was $18,037 per year in 2013. But a student working over the summer at the minimum wage would have only been able to earn $4,930, or only a bit over a quarter of the cost of attending school. Working full time over the summer and during vacations, plus 10 hours per week during the academic term, the student could have only earned $8,555, or less than half the cost of attending school. As a consequence, students must now rely on their parents (when their parents can afford it), or a scarce number of scholarships (highly limited, especially for state schools), or on student loans. Otherwise, they must give up on attending university. The result has been an explosion in student loan debt outstanding. As of June 30, 2014, student loan debt totaled an estimated $1,275 billion (based on Federal Reserve Board estimates), or five times the level outstanding in 2003 of $250 billion (the earliest figures I could find on a comparable basis; the amounts were so small earlier, that the Fed did not separately break them out). Student loans have long been common in the US (I had them when I went to school in the early 1970s). But the amounts outstanding then were relatively small, were at low interest rates, and were for most of us easily manageable. It is different now. Student loan debts have exploded in recent years, with a five-fold increase over just the past decade. The declining affordability of college by this measure is of course a consequence of what has been happening to the two components of the measure. One has been the unwillingness of Congress to allow the minimum wage to keep up with inflation. 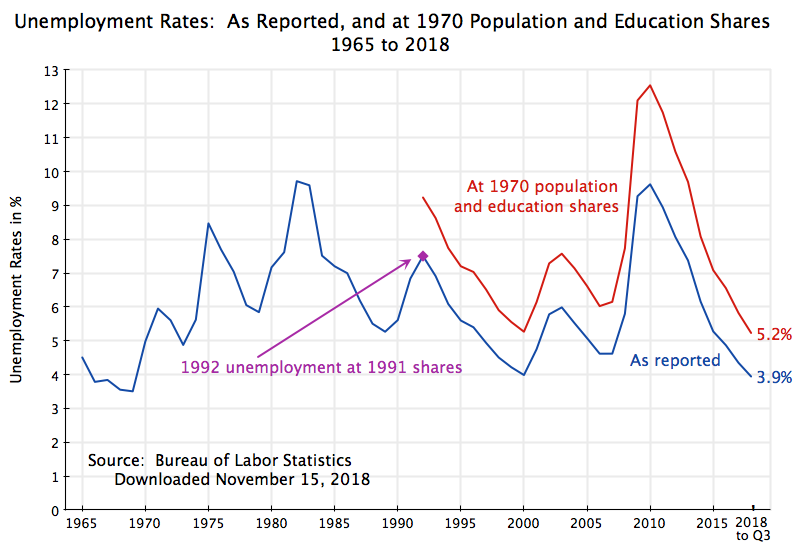 As noted in an earlier post on this blog, the minimum wage in the US has stagnated over the last half century, and is indeed lower now (in real terms) than it was in 1950, when Harry Truman was president. Real GDP per capita is 3.5 times higher now than it was in 1950, and real labor productivity has increased similarly. These are not small increases. I find it amazing (and shameful) that the real minimum wage is lower now than it was then. For the period since 1963 (the earliest date in the chart), real GDP per capita and real labor productivity are both now 2.7 times higher than what they were then. But the real minimum wage is close to 20% less now than it was in 1963. The fall in the real minimum wage fall since the 1960s is half the story. Note that the inflation measure used for determining the real minimum wage is the general consumer price index (the CPI). This is the price index for the overall basket of goods and services a US household will purchase. But the price index is an average over all the goods and services that households buy, and individual items can have price increases that are more than, or less than, this overall average. In particular, the cost of attending a state university has increased by a good deal more than the overall CPI. Based on the overall CPI, the real cost of attending a state university (for tuition, room, and board) is now 2.5 times what it was in 1963. The cost of the tuition component alone is now 4.5 times higher. The basic cause has been the cutbacks in state budgetary support for their colleges and universities, with tuition and other charges then increased to make up for it. 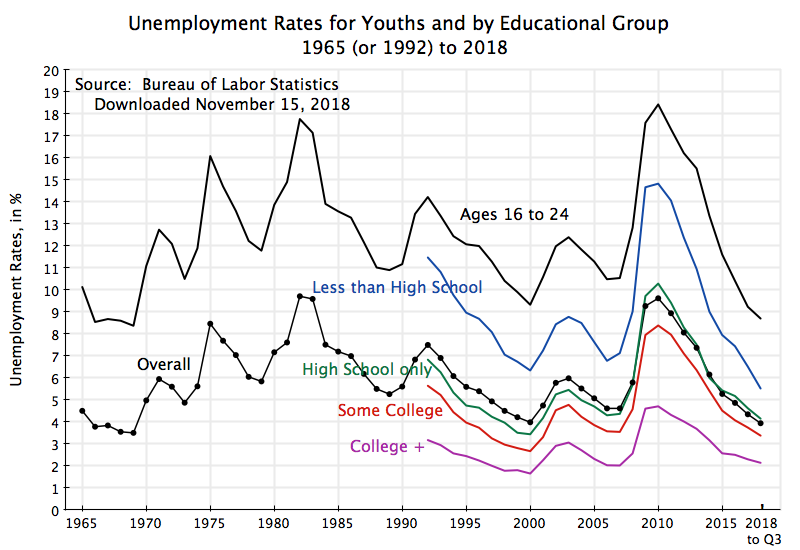 As a result, the minimum wage has fallen in real terms (based on the overall CPI) since the 1960s, at the same time that the real cost of attending school (relative to the overall CPI) has increased sharply. 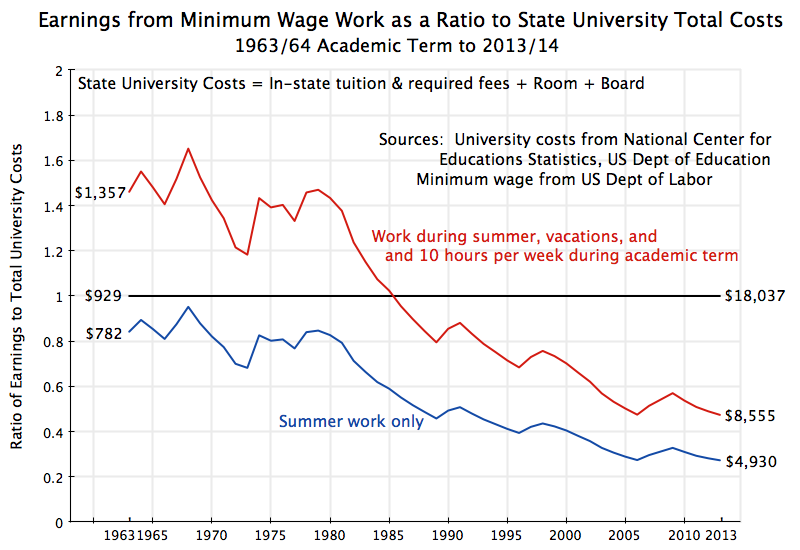 The two factors together account for the steep fall in the share of state university costs that one can pay for by working at the minimum wage. The curves in the chart at the top of this post show that path. It is important to recognize that this declining affordability of attending state schools was not inevitable, but rather the result of policy choices. The minimum wage has not been adjusted to reflect general inflation, even though real GDP per capita and labor productivity have both grown substantially. And as was discussed in another post on this blog, there is no evidence that raising the minimum wage by the modest amounts now being discussed would lead to adverse effects on employment. Government support for state colleges and universities has also been scaled back, leading to tuition and other cost increases substantially higher than that reflected in the general price index. This has also been a policy choice. And it is a policy choice that has prioritized the present generation (with tax cuts a prime example) over the coming generation, that is denying many of the coming generation the educational opportunities we ourselves had. The lead article in the Metro section of today’s Washington Post is headlined: “DC has widest race gap in tests”. It reports on two studies released yesterday (math and reading) by the US Department of Education, which provide figures from test results of 4th and 8th grade students in various urban jurisdictions around the country, with these results broken down by race among other categories. Figures are provided on 19 urban jurisdictions, which vary between large cities such as New York, Chicago, and Los Angeles, and smaller jurisdictions such as Jefferson County, Kentucky (Louisville) and Fresno, California. As the headline states, and as the primary point of the article, the gap in test scores between white and black students in DC public schools, is larger in DC than in any of the other jurisdictions. This is factually correct. But the Washington Post article never notes that the reason the gap is so wide in DC is in part due to the fact that the test scores for whites in DC public schools are the highest in the nation among the 19 urban jurisdictions reviewed, for both reading and math, and for both the 4th graders and the 8th graders. Indeed, the test scores for whites in DC public schools are higher in all four categories than the average scores for whites in any of the 50 US states reported in the similar studies issued by the Department of Education on November 1. And note that these test results are only for students in DC public schools: students in charter schools and in private schools are not covered. Note also that the share of white students in DC public schools, while low, was not the lowest in the country: 7 of the 19 jurisdictions had a lower share of whites in their public schools in the 4th grade, and 2 of the 19 jurisdictions had a lower share in the 8th grade. The gap is wide in DC also because the test scores reported for blacks are low. For the four scores for 4th grade and 8th grade reading and math, the scores for blacks vary between the second worst and the fourth worst among the 19. It is important to know this. The results indicate that students can do well in DC public schools (the white students score higher than any of the others in the 19 urban jurisdictions, and higher than whites in any of the 50 states). But black students are not doing well, and one should focus on trying to understand why. Finally, the city with the “best” (lowest) racial gap among the 19 was Cleveland for the 4th grade students, in both reading and math. Cleveland’s gap in the scores was only 22 in reading and 21 in math. In contrast, the gap for Washington, DC, 4th graders was 64 in reading and 60 in math. But Cleveland achieves this distinction of being “best” in the nation by the criterion the Post judges as most important, by having the worst scores among the 19 jurisdictions, for both whites and blacks in both reading and math. This is obviously not something to emulate. One clearly should want to reduce the racial gaps in such test scores in DC as well as elsewhere. But the intelligent way to start to do this is to recognize that at least a certain group of students is performing pretty well in DC public schools, with scores that are consistently the highest in the nation in the jurisdictions reviewed. This is relevant, but never mentioned in the Post article. It suggests that the curriculum and other practices in DC public schools can produce good results. But blacks in DC public schools have struggled, and the focus should be on how to raise this.